Is Stand Up Paddleboarding a Good Workout? Like most answers, it depends! A person’s current health and medical recommendations will play a role in whether using a SUP is a good workout for them. We can tell you that brisk walking is an activity recommended by the U.S. Department of Health & Human Services, the Office of Disease Prevention and Health Promotion, the Centers for Disease Control and Prevention, and your pet dog. If we can take casual paddling up a notch to “brisk” paddling, then stand up paddleboarding can be better than walking. Given the physical activity guidelines by the three administrations and your pet dog above, paddling a SUP board is a good workout! What Paddle Board Exercises Can You Do? Standard paddle boards are 10’ in length and 30″ wide. This provides a large deck space to exercise on, including exercises that involve laying down. There are a lot of different exercises available on the paddle board. Much of it revolves around repetition, balance, and targeting the core abdominal muscles or arms (if you’re paddling). So what exercises can you do on a paddle board? You might have heard of paddlers buying SUP boards for yoga poses. We have a buyer‘s guide on the best yoga paddle boards to help you find the most stable and biggest surface area boards, but even standard boards can be enough for any yoga enthusiast. No pose is off limits thanks to the wide and long surface area of paddle boards. Namaste! Paddling by itself can be a tough exercise. When you consider travel distance on the water or speed and performance, you can expect your entire body to become sore. Paddling in different positions will also work out different muscle groups. You can stand, sit, or kneel and paddling will feel like an entirely different sport! Getting on and off the paddle board (known as Splash ‘n’ Sculpt) involves lifting your body out of the water on onto your board. You push into a board, trying to keep yourself balance, to put yourself over into a Superman pose. Then, you can lower yourself back into the water and start over again. We also can’t forget the water you’re paddling on. Calm and quiet waters give you minimal resistance while choppy and high wave water give you the workout of a lifetime. Powerful waves and swimming against currents test your strength and endurance altogether. Which type of water current will you paddle on? 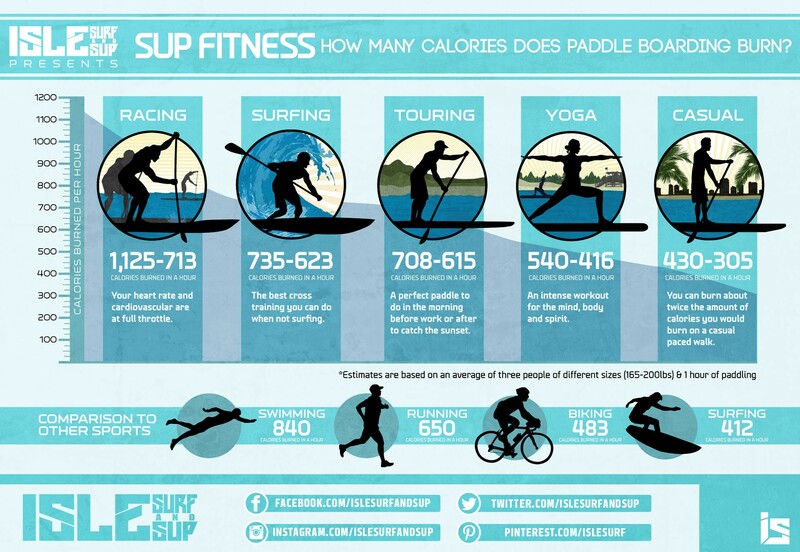 How Many Calories Do You Burn Stand Up Paddle Boarding? Thanks to the breakdown by Austin Cox of SupWorldMag.com, we learn that paddling a SUP can burn anywhere between 305 to 1,125 calories an hour paddle boarding. This number can be even greater if you paddle into the headwind in choppy water and riding waves on your paddleboard. Courtesy of Isle Surf and Sup on calories burned paddleboarding. Click to enlarge. As we might expect, the physical exertion of racing on a SUP burns the most calories while casual paddling consumes the least. What Paddle Board Muscles Used When Out on the Water? Stand up paddle boarding uses the major muscle groups in your back, arm, and core muscles. Legs are engaged, but not as much as the other parts of our body as the legs work to keep you balanced while standing still. These muscled used are from the motion of paddling and pulling (or pushing) against the water. You can work your core muscles even harder when you ride through choppy water and ride the waves. Is stand up paddleboarding hard? That depends entirely on you. As long as you can swim and paddle (sitting or standing), then you can paddle intensively or paddle as if you are out for a stroll on the open water. You can also exercise on your paddle board, battle choppy water and heavy waves, or do yoga while trying to balance on your SUP board deck. Whether you are taking it easy or working out to break a sweat, one thing is for sure: paddleboarding is way tougher than walking briskly!